Many Moroccans like to distill their own rose water, so you'll find vast baskets of roses on sale, especially in spring. While more senior Moroccan men use it as cologne, it's more commonly found in refined preserves, drinks and sweet pastries. Made with almond paste or dates and figs, these come in delicate shapes and are traditionally served at the start of a meal. For every English cook there is a recipe for rice pudding. Ditto for muhallabia in the Maghreb. 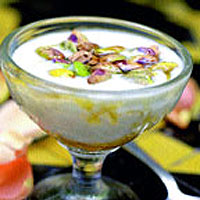 This is a cold, creamed rice pudding, flavoured with spices and garnished with nuts. Serve it chilled in glasses with the addition of some honey and a little gilding of the lily - a few spoonfuls of double cream. Pulverise the rice in a blender or a food processor, until it is as smooth as possible. Transfer it to a saucepan along with the milk, cardamom pod and sugar. Bring to the boil, turn down the heat and stir continuously for 15-20 minutes, or until the mixture has thickened and no longer tastes raw. Leave to cool for 5 minutes. If the rice now seems very thick and claggy, stir in a splash of milk. It should resemble a smooth porridge at this point. Stir in about 1 tsp rosewater to start off with and taste until you are happy with it. It can vary in strength so a little more may be needed, but exercise caution or it can prove a little too aromatic. Pour into glasses and chill in the refrigerator for several hours. When you are ready to serve, sprinkle some pistachio nuts into each glass and drizzle in a spoonful of honey and a dollop of cream. The rich, exotic textures and flavours of this pudding work beautifully with a creamy, honeyed botrytis Semillon.